Bridget Donahue Gallery, which opened in Chinatown in February 2015, can definitely claim a two-for-two. The New York Times described the Gallery’s inaugural show, Lynn Hershman Leeson’s ‘Origins of the Species’ (February-April 2015) as ‘prophetic’ and the New Yorker named its current show, Susan Cianciolo’s ‘if God COMes to visit You, HOW will you know? (the great tetrahedral kite)’ (May-July 2015), ‘enchanting’ and the gallery ‘terrific.' Congratulations are in order, both to the artists and to the owner, Donahue herself. Meanwhile, the show goes on. Donahue describes opening and closing the gallery five days a week, flipping on the lights and clipping the little flower. 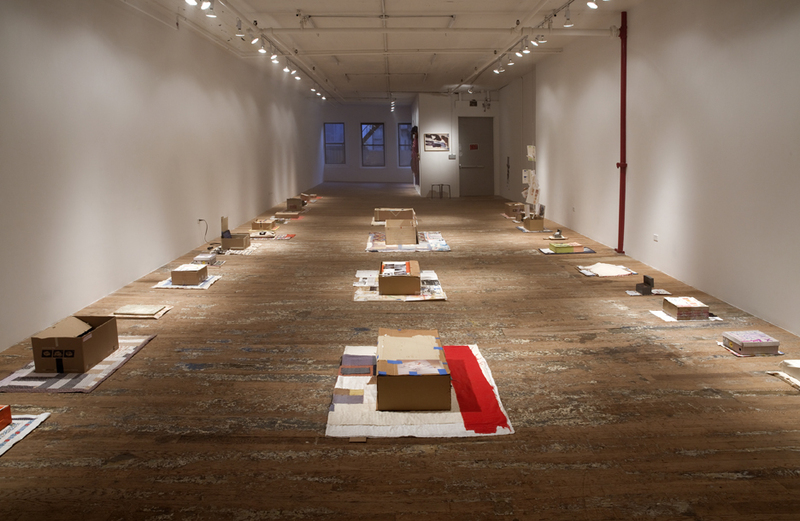 During this interview, which took place over Jessi Reaves’ ‘No Reason Work Table’ (2015), a delivery arrived, a pair of shoes to be placed among the costumes, quilts, and kits (which Donahue describes below) that comprise Cianciolo’s show. The shoe’s bag, an actual shoe bag, was noted. Only Cianciolo, Donahue smiled, would have one on hand. In the kits, most of which are boxes, are slippers, sketches, sneakers, and much more. A film, played on a laptop peeking out of a cardboard box, presents conversations about fashion, some with Cianciolo’s former students. Fashion is here, but it is bundled and wrapped, stitched, transformed. Cianciolo is a constellation artist and fashion is one of her many stars. Mae Colburn: Let’s start with the gallery. What prompted you to open this space? Bridget Donahue: I told people I never wanted to have my own gallery. I thought you had to be a rich person to do it. I really respect galleries, the tradition of it, and I learned from people who take it seriously. That was the hardest thing about the transition – I actually loved where I worked. It was my dream job in many senses. My three jobs were Gladstone Gallery, D’Amelio Terras, and Gavin Brown's enterprise. And Cleopatra’s, but that wasn’t a paycheck. That was me tithing my own wages with a group of people. There are different models, but if you stand to make money from an artist, in my opinion you should be working for that 50% and constantly promoting them. That’s the biggest contribution I can make, is the fact that I do run my mouth pretty energetically when I’m into something. With a gallery, you invest in things, you help produce artworks, you help move them around, you photograph them, et cetera. MC: You really support your artists. It sounds like you’re moving into the market with a lot of integrity. BD: That’s the hilarious reality is that the first couple shows here are not particularly easy sells, the joke being that my commercial gallery starts off being wildly anti-commercial. But I believe in them so much that it doesn’t matter. And things are paying for themselves. There’s a great tradition at Gavin Brown’s enterprise of doing seemingly non-commercial shows, but he’s just this incredible person who can actually turn that around. This [space] is a little more of a humble comparison, but it’s funny too. Sometimes people come to this show [‘If God COMes to visit you...’] and are like ‘Ok, is anything here for sale?’ They can’t believe that Susan would be willing to part with some of this stuff. It’s so meaningful and impossible to make again or get back. She’s cared for these things for sometimes up to twenty years and part of the whole exhibition is about that letting go, which blows my mind. When Alex Fleming, who curated the archival work in the back and the costumes [in front], introduced me to Susan, he thought I would be interested in the photo archives. And I think this is absolutely part of the story, but I never for once saw an exhibition of framed photos, framed watercolors, and framed paintings. And at the same time I never saw an exhibition with clothing. It was the second I saw those boxes that I was blown away. And then when I found out that the kits were actually part of her fashion line and that she actually continues to organize and think about and collect things in these tailored boxes, I was like, ‘we have to show these, they’re unbelievable.’ It was that idea that the paintings and pictures and archival clothes and all these other precious things are just taped together. MC: That’s the thing. 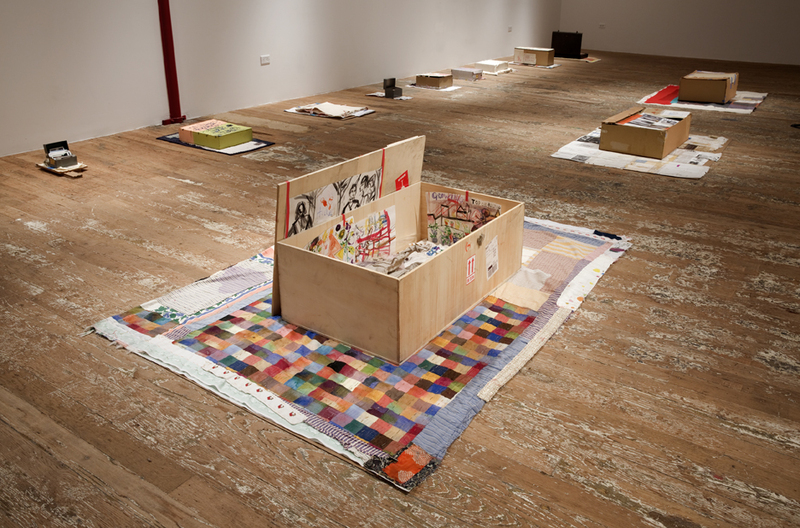 Both of the artists you’ve shown work across media: paintings, photographs, cardboard, tape. How do you approach the labels that often accompany these different ways of working? BD: I’m thankful that I don’t see such categories existing - that could be in part because craft education was one of the first art-education experiences I had - via the social sciences, I studied Anthropology, within that category, craft is art. A more euro-centric, academic appreciation of Art helps me to understand a socialized history of forms and predecessors but it does not aid me in understanding when I feel work is important. Nothing about this project is about trying to import craft or fashion or design into an art context. I’m not thinking, ‘this is where craft meets art.’ I’m not interested in that position. It’s like if you label anything, like when somebody says they’re vegan and then somebody busts them for wearing a leather belt. I don’t want to say, ‘I’m just going to show good things that I care about,’ because that sounds almost self-righteous or even naive, but that is more genuinely what I want to do. It will be interesting to see what I’m interested in, but it will take a while to define that. For now, with Lynn and Susan, as much as people want to assume the program has a strategy, it was also an easier reality. I got the space and moved in in October 2014 and opened in February 2015 and it’s really hard to ask an artist to make a show in that amount of time. It’s easier to show people that have existing work and are a little more confident in what that work is, and also that are eager and willing to participate. That’s a huge thing. It’s about collaborating with a really exciting, relevant person in my mind and learning from them. MC: Is there anything you would like to add about this show, maybe in the context of Fashion Projects? BD: One thing in the context of this publication was how much I thought Susan’s show would attract an audience that I hadn’t met in past experiences, and it did. It’s kind of like living vicariously. Also, the opening was really young. That’s my first and favorite person to impress - an art student or a young working artist. If those people are into a show, that makes me most happy. Then of course everybody else will be psyched because those are the people who are leading the discourse, or where all the energy kind of bubbles from. So it’s that audience, I’m eager to impress. After that I was really interested in meeting different people from fashion, because Susan embraces that world. And yet I also feel really strongly that the works in Susan’s show stand-up to any kind of hard line capital ’F’ fine art. For people who consider themselves designers, maybe their project is made better by tons of funding and bigger production lines, but I think that in many ways for Susan that never felt like the right move. It wouldn’t better her project. That to me feels like an artist’s decision, not a designer’s decision. It’s really courageous. You couldn’t have created a better ascendency within the context of fashion, but she didn’t take that sort of golden road laid out for her. It’s incredible to me that someone can keep up that devotion to making something. MC: That’s true, but I have to hand it to you. You’ve made something great here, too. BD: And that’s still totally mind-boggling to me. To come into the gallery, flip on the lights and, clip the little flowers for the day. I show up every day like it’s my job. It’s refreshing to slowly realize I know how to do it.